Figure 1. 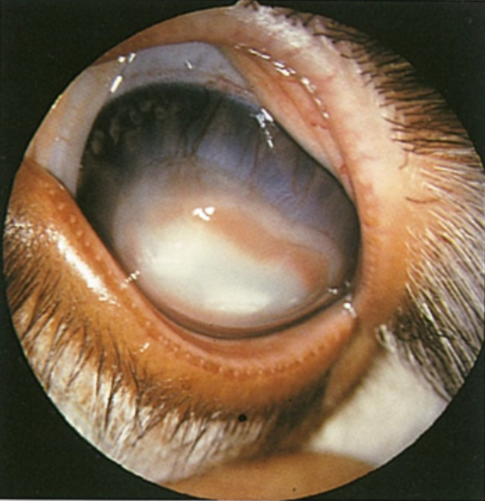 Infectious bovine keratoconjunctivitis in a calf. Note the corneal vascularization, stromal abscess, and scars. Source: Bruce H.G., Cheryl L.C. and Robert L.P. (2004) Veterinary ophthalmology essentials, 1st edn., Philadelphia: Elsevier. Figure 2: Presence of Thelazia. Source: University of Sydney Centre for Veterinary Education (2012) Thelazia spp, Available at:http://vetbook.org/wiki/cow/index.php/Thelazia_spp (Accessed: 3rd June 2014). Transmission occurs through route of flies that feed on animal's ocular secretions, tears and conjunctiva. suppression of inflammation & secondary bacterial infections. Bogaard A.E.J.M. (2011) 'Veterinary Quarterly', Inclusion keratoconjunctivitis ('pink eye') in sheep, 6(4), pp. 229 -235. Deepthi B. and Yalavarthi C. (2012) 'Eye Worm infection in a Cattle - A Case Report', Veterinary World, 5(4), pp. 236-237. Naem S. (2006) 'Thelazia rhodesi (Spirurida, Thelaziidae), bovine eyeworm: morphological study by scanning electron microscopy', Parasitol Research, 100, pp. 855-860. Otranto D., Tarsitano E., Tarversa D., Giangaspero A., DeLuca F. and Puccini V. (2001) 'Differentiation among three species of bovine Thelazia (Nematoda: Thelaziidae) by polymerase chain reaction–restriction fragment length polymorphism of the ﬁrst internal transcribed spacer ITS-1 (rDNA)', International Journal of Parasitlogy, 31(14), pp. 1693-1698. Otranto D. and Traversa D. (2005) 'Thelazia eyeworm: an original endo- and ecto- parasitic nematode' Trends in Parasitology, 21(4), pp. 1-4. University of Sydney Centre for Veterinary Education (2012) Thelazia spp, Available at:http://vetbook.org/wiki/cow/index.php/Thelazia_spp (Accessed: 3rd June 2014).